Georges Seurat’s A Sunday Afternoon on the Island of La Grande Jatte – 1884 hangs in the Art Institute, but another masterpiece inspired by this work can currently be found at Navy Pier’s Chicago Shakespeare Theater. Gary Griffin’s five-star revival of the Stephen Sondheim musical Sunday in the Park with George is an inspiring and gorgeous production, featuring a stunning lead performance from Jason Danieley. A native of St. Louis, Danieley got involved with theater in high school, when he began performing at the St. Louis Symphony and Six Flags St. Louis. He received classical voice training at University of Missouri in Kansas City and Southern Illinois University but never finished college, instead moving to Champaign for a short stint doing dinner theater before heading to New York. He received his big break when he was cast in the title role of Hal Prince’s Broadway revival of Candide, and has since been seen on Broadway in The Full Monty, Curtains and Next to Normal, in which he starred opposite wife Marin Mazzie. Danieley speaks to us about this role's challenges, how Sondheim's music enhances the character, and the ways he relates George's story to his own life. What was your first experience with Sunday in the Park with George? Actually, when I was in Champaign doing A Chorus Line, Little Shop of Horrors, and Camelot, living in the actor’s housing, a friend of mine who played Morales in A Chorus Line brought the video cassette of Sunday in the Park with George. And I had already been exposed to Sweeney Todd, so I knew who Stephen [Sondheim] was but I didn’t know Sunday. Actually, a bunch of the ladies from A Chorus Line recently came to see the show and we had a little 21-year reunion at the Shakespeare Theater and we were talking about how it really had emotionally impacted us at a very young age. What has been the biggest challenge for you in this part? Not crying every minute of the show. [Laughs.] It really is something else, and that experience through singing other Sondheim songs—this is actually my first Sondheim show that I’ve done—that through my life it meant different things at different times. I was moved by it when I first saw it, but 21 years later it has a different profound effect. Especially since then I’ve lived through a lot of what both Georges have experienced as an artist. As a theater artist, varying degrees of sturm und drang of the creative side, and also the sort of annoying but necessary part of putting it together—that’s George in Act II. I’ve really experienced so many aspects of their journeys that it is a deeper experience now at 41 doing this. So trying to keep it together is probably even more challenging than trying to remember all the lyrics and breathing during some of the songs that go so quickly by. How does the music help you get into character? Because it is so specific, there are so many—well like in Act I, it’s very pointillistic in Stephen’s underscoring to the scenes that it really sets an internal rhythm for the character. A sort of agitated, pointillistic feeling throughout Act I and then of course the sweeping, sort of rolling water that sits underneath George in Act II trying to figure out who he is and where he’s going. It’s just there, you actually don’t have to think much about being in character. All you have to do it show up and it sort of fills you up from your toes to your hair follicles. How much research did you do into Georges Seurat’s life? There’s not a whole lot written, there’s not eight different biographies or anything like that, but I did do as much research as I could. I had a wonderful biography, sort of a sketch of his life, and I don’t like to do too much because sometimes there’s more information than you actually need, and all it does is kind of muddy the waters. But there are a lot of relationships, like his relationship with his father which was complicated because he was looked at as an eccentric man. Trying to avoid growing up to be his father is an interesting thing to have in his back pocket. His relationships with his mother, things like that I did do research. His obsession, his scientific approach to painting which was very on the fringe of art. I think now it looks very oh, we know what that is, that style of painting, but at the time it was banned and not shown in certain art exhibits. It was so scientific and kind of cold, and the way that people perceived him, his perception of society at that time was looked at as really scandalous. So I think you need to refresh your mind how on the outside he was, enough to give me a variety of colors for my palette, to use an obvious metaphor. In Act I, the show is about how art interferes with his relationships, in Act II it’s about himself interfering with the creation of art. How do you relate to those ideas? For me, starting off in the business of life at a young age of becoming obsessed with storytelling and singing and acting and theater, I was one of those kids that closed the door and listened to Mandy Patinkin’s soundtracks, Evita and Sunday in the Park with George. Or listening to the people I admired—I really admired Luciano Pavarotti—listening over and over, a real obsession. I spent hours listening to music and seeing, and I think there’s a similarity to that with Seurat. Obviously he was creating something, so his isolation was different, his demons were different, but I think most people can relate to that if they have a passion, particularly if it becomes their career. If they’re obsessing over it and poring over it and spending hours and hours and days and days working on it, it can isolate one unless they have a healthy way to escape that. At least my creative aspirations are limitless, what I choose to do. I need to be the person who makes those decision and not let other people make those decisions for me, to borrow the idea of a lyric in "Move On" that Dot sings: “Let others make that decision, they usually do.” The idea of someone perceiving you and pigeonholing you in something but you knowing exactly what you have to offer. I say that by way of thanking Barbara Gaines and Gary Griffin for seeing outside of what some people typically perceive as just a brooding character, which I might not necessarily be cast as. But they were gracious enough to see a complicated person in me, that I could bring something to this role that is hopefully a little different than what people are expecting. What was the experience like at the surprise Art Institute performance? It was extraordinary. It really was. It was a huge crowd, the main staircase where we performed was packed with visitors to the museum; I don’t think they knew exactly what was going on. They just started gathering because other people were gathering. And we spent some time with the actual painting as we were waiting to go on, so we were all in costume and so all the characters were literally alive in front of the painting. It’s different when it’s on stage because you don’t have the real thing, but then to stand in front of this 100+ year old painting that inspired so many people was extraordinary. And then to be able to command the characters, as I called them from various corners of the museum with the words that George uses “order, design, composition, balance, light and harmony.” They just started coming out of the woodwork to sing the song, it was extremely moving. I loved what Gary did with the ending of the show. What do you feel having the characters come out in white with no wigs or costumes adds to the production? Hopefully it illustrates, and I think it does, that everyone sees this for themselves. That the story is larger than just Seurat’s story or even the second-act George, that one could place themselves in this position of George. At least see some parallels to their own lives, that if they’ve gotten to a point in their life they can look ahead at the possibility of change in an optimistic way, in the same way that George does at the end. It’s not just about Seurat’s characters, it’s a more beautiful and hopefully universal metaphor for the audience. Hopefully they get something inspiring for themselves to move on and start whatever chapter might be ahead of them, to take that leap. Sunday in the Park with George runs through November 11 at Chicago Shakespeare Theater (800 E Grand Ave, 312-595-5600). 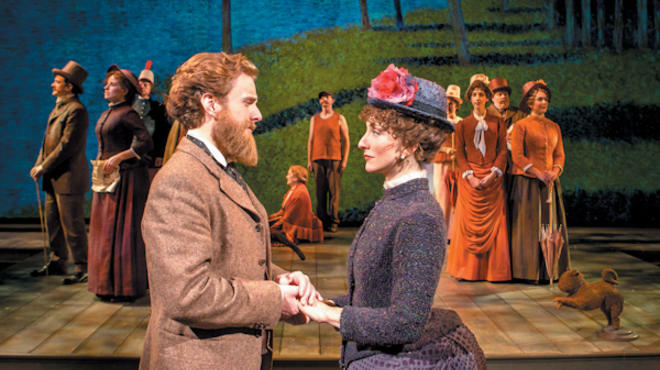 Read our review of Sunday in the Park with George.